B&Bs can be odd lodgings; something about the intimacy of staying in someone’s home that leads you to creep about, attempting to be unobtrusive. Or maybe that’s just me. Cam was happy to wander into their kitchen for a chat and come back very pleased with herself, waving a bucket of ice and two glasses. Drinking half a bottle of whiskey between us probably wasn’t the most sensible idea the night before a long day, but someone had the daft idea to blog this trip as we go and something had to break the writing block brought on by car crazy braindeadness; so that’s what we did, until god knows what hour. The result: a palpable air of hysteria carrying us through today. We laughed almost solidly all day, for the most part we know not at what, but everything was funny. It’s not often you can spend almost an entire day laughing and its good for you, so that justifies the whiskey consumption! Pork pies aren’t very nice. But the pork pie hails from Melton Mowbry in Leicestershire and Ye Olde Pork Pie Shoppe opened at 8am so that was breakfast. We had some hope that, being the original, hand crafted specimen, it would change our feelings towards pork pies. It didn’t. It was OK, but the congealed jelly of suspect origin that sits between the meat (from god knows what part of the pig) and the pastry is nasty. Leicestershire, self-proclaimed ‘heart of rural England’ (it’s all pretty rural, so one can only assume they wish to claim to be the heart of all England … not with pork pies they’re not), is also home to national treasure Sir David Attenborough, so maybe that’s why. Woolsthorpe Manor wasn’t open when we arrived, but we knew this would be the case. I’d visited many years before and had a lovely time playing with the sciency things, but we chose this spot anyway, to reflect on the genius of Isaac Newton … by dropping apples on our heads. Have you tried to balance an apple with a pointy bottom on your head? It’s not easy! But we persevered, because once you decide to balance an apple on your head and take a selfie you’ve got to keep trying until you get the shot. Cam developed a headache shortly afterwards from dropping her apple on her head from too great a height, hoping to make a great boomerang clip. It didn’t. All this, of course, was absolutely hysterical. We’re easily amused. There’s more to Nottingham than meets the eye. Hundreds of individual hand dug caves lie beneath the city, their uses varied from basements to pub cellars; tanneries to cesspits (or ice houses, the archaeologists can’t decide). During the war, tunnels were made between caves to create air raid shelters. Just as well as evidence shows that some of the basements were bombed to buggery. It was fascinating. Working in the tannery in an airless cave must have been a particularly gruesome profession. Continuing our tasting tour of local ales, we stopped at Ye Olde Trip to Jerusalem – England’s oldest Inn allegedly - for a swift half. When planning this trip, I fell down a rabbit hole of trying to identify the oldest thing in each county; along with the local food, birthplace of the county’s most historically important resident and so on. An over-ambitious assignment to say the least, but at least we found the oldest inn. Of course, there’s much more to Nottinghamshire than caves and pubs. More English folklore permeates Sherwood Forest, stomping ground of Robin Hood; that altruistic outlaw in tights. We opted out of prancing through the forest in tights. Derbyshire is utterly beautiful. I’ve always particularly loved the area around Matlock. There are rivers and waterfalls and beautiful landscapes. But we chose to head underground, to explore one of England’s cave systems. Poole’s Cavern was first inhabited by Celts, then the Romans came, along with Arnemetiae (goddess of the grove), and moved in for a while. Fast forward a while and Mary Queen of Scots, whilst under house arrest in Buxton, would be allowed to bathe in the spa water at Buxton to relieve her ailments, and visit the caves. She declared one particular stalagtite as the most beautiful thing she’d ever seen. Clearly she’d gone mad. It was ugly and resembled a giant slug. Just as slimey too. The cavern has among its formations, rare ‘poached egg’ stalagmites. So called because they have an orange tip. They look nothing like poached eggs. They look like giant dildos. Which, of course reduced me to giggles. Cam tried her best to shield the earnest 20 year old tour guide from my convulsions, but it was hard in our small group of four. It was a fun hour, but my favourite of England’s cave systems is still Wookey Hole. We chose Wigtwizzle as our stop off for South Yorkshire, purely for its name; and that we needed a point of reference to take us through the Peak District to enjoy the drive. Which we did. But no wigs or twizzles to be found in Wigtwizzle; just a barn. I suspect the woods were it. The Peak District actually lacks peaks! It’s named after the Anglo Saxon Pecsaetan tribe who inhabited the area in the 6th century. What it does have is softly undulating hills, and lush green fields bordered by neat dry stone walling, creating patchwork patterns dotted with cows and sheep. Sometimes the distinction between sheep and cow was not clear as we whizzed by. There were some, sheep we concluded, that were enormous with fluffy brown coats and aspirations to be highland cattle. This is the most intelligent conversation that took place all day. As the skies became tempestuous, we stood (me sulkily) and looked at the meagre ruins of an unremarkable castle littered with broken glass bottles (clearly a hang-out for the local youth) somewhere outside of Wakefield. While it possessed a bit of history – the battle of Wakefield during the War of the Roses was fought here – it wasn’t our intended destination in West Yorkshire, which has so much more to offer! But we hadn’t considered the rush hour traffic and holds ups around Bradford, so we ditched our plans to visit the Salt Mills at Saltaire in the interests of finishing the day before mid-night. There are cats adorning the buildings of York. We had planned to walk the streets in search of them. But pretty much the only thing on our minds as we approached York was Yorkshire pudding, so we forgot about the cats. (Sorry cats). First we were distracted by our lodgings, a working convent since 1686 which has a secret chapel – the dome is not visible from the outside to provide protection since Queenie had outlawed Catholicism – and Mary Clitherow’s mummified crushed hand. St Mary was crushed to death for harbouring catholic priests in a time when it wasn’t the done thing to harbour catholic priests. The nuns used to run the school until it became a comprehensive, then turned their hands to offering lodgings – very comfortable they were too – and being generally good and wonderful in the community. The convent is now also a living heritage centre. Washed of all our sins – we showered in the convent, that counts surely – we hit the streets of York, soon to be distracted by a tavern on The Shambles, before heading to Mr P’s Curious Tavern, on the recommendation of Sara from the convent (not a nun, but the very lovely lady who showed us the priest hole and the manky mummified hand). We could have eaten everything on the menu twice over but it had to be the Pig in Pudding! Other than a quick gawp at the Minster, that was our tour of York concluded but it’s worth spending more time exploring what is one of my favourite cities. Besides Lindisfarne, which we don’t have time to visit on this trip, York is the best for Viking heritage. Also a short hop from York is Scarborough which is the most delightful, step back in time, English seaside town. And I haven’t even started on the raw, honest beauty of the Yorkshire dales. Arriving late into Oxford, and walking the necessary 15 minutes across town from the car park to our lodgings, tired and laden with bags was worth it. Not only does The Tower House and Turl Street Kitchen provide a comfortable room and delicious locally sourced food, they are a social business that supports The Oxford Hub. And it is located right next to the quads of Oxford University allowing an early start exploring! Whatever, Oscar, I never liked Oxford anyway. I’m lying. I really like Oxford. But we came for the Bodleian Library, specifically the reading room with its 17th century books; and they wouldn’t let us in. So I’m sulking! Our research was good; the library does indeed open at 9.00am. But our research was not good enough; the guided tours – which are the only way you can visit the reading room because, as the librarian with the fixed smile and slightly patronising tone told us at least 5 times, it is a working library – don’t start until 10.30. Tears were fought back and a full-on tantrum from both of us was considered. Because books! Because of the knowledge, and history, and social commentary, and fantasies they contain within their pages. Because of the dreams, curiosity and understanding they inspire. Because the feel of their covers and the smell of their pages. OK, we might have been a little bit tired, but we were massively disappointed. As Hilaire Belloc so succinctly put it; "There are few greater temptations on earth than to stay permanently at Oxford in meditation, and to read all the books in the Bodleian." We both silently and seriously contemplated hanging around for the first tour, but we’re on a schedule so we skulked off to find the Eagle and Child; favourite hang-out of literary heroes JRR Tolkien, CS Lewis and the rest of the Inklings, hoping some of the clever that permeates the air of Oxford would rub off. It didn’t. But walking in the footsteps of some exceptionally awesome people took our minds off the Bodleian a little bit (not much). Is there a child that hasn’t, at least in some small way, had their imagination fuelled by the work of Roald Dahl? The museum in the pretty little town of Great Missenden where he spent many years, was created by his widow, and includes the contents of his writing shed exactly as he left it the last time he worked in it. I stood there for I don’t know how long taking in all the nic-nacs, feeling quite emotional. (Did I mention we’re a bit tired?!) I cheered myself up my making silly rhymes on a faux fridge door with letters provided. An hour or so later we emerged from this little piece of loveliness and hit the road, making a quick upwards detour to fit in Bedfordshire. ‘Up the wooden hill to Bedfordshire’ … OK, so not a quote that conveys a sense of the county, and I’ve no idea where this comes from but my parents always used to say it to us and now I say it to my kids. We’re really sorry Bedfordshire, but 48 counties in 9 days is a pretty tall order and some counties must be flown through. You are one of them. I’m sure you have some lovely treasures hidden away but they weren’t forthcoming in our research so we chose a fly by photo shoot of London Luton Airport, taking a few moments to dream of where we could have spent 10 days, rather than driving through England. So, yes, London Luton Airport … because Bedford’s in London apparently. It’s not! Bedfordshire, you don’t even border London; you’re not even a home county, so bit of a stretch of the imagination there. But I will take this moment to thank Sir Stelios for cheap European flights! Hurrah for Luton Airport ... it is a wonderful gateway to mainland Europe. The East India Company was founded in Hertfordshire, with the objective to break the Dutch monopoly of the spice trade with the East Indies. And George Bernard Shaw, Beatrix Potter and Ron Weasley all herald from Herts. But we chose to eschew all that good stuff and spend a couple of blissful hours in the scorching sunshine admiring Henry Moore sculptures! The Henry Moore Foundation sculpture gardens, resplendent with orchards, sheep fields and, um, sculptures provided a couple of hours of tranquillity which we savoured ahead of our impending soiree up town. And he was a jolly decent chap by all accounts. Lived very simply, turning down a knighthood for fear of alienating himself from his fellow working class artists whom he felt deserved equal acclaim, and pouring all his (significant) profits from sales of his work into the arts. Again, the car journeys have been characterised by lush spring countryside, though starting to flatten out the hedgerows are adorned with swaying cow parsley and horse chestnut trees in blossom. The winding roads, lined with avenues of arched trees, are punctuated by pretty little villages boasting pubs with names like The Queens Head and The Red Lion. There was an air of procrastination about our onward journey to the capital. Tired, and anticipating another late night, neither of us was feeling particularly Londony. We both love London, but usually our visits aren't the full stop at the end of several days of travelling. Well, Sam, we're women. So there! And we are not tired of London. And though we arrived at our hotel hot, sweaty and tired, we were more than happy to hop on a tube into the City of London, admire Christopher Wren's magnificent St Paul's Cathedral and pootle over the Millennium Bridge for a steak supper next to the Globe Theatre. City of London - done! Bong, bong, bong! ​We bundled into the rickety lift, pulled the metal lattice door across and waited for it to bump us up to the second floor, but not before one of the coven of witches had peered into Camilla’s soul. Not unusual companions, i suppose, to find at the charmingly confused Camelot Castle Hotel, with it’s splendid round table posed in front of the picture window overlooking the sea, and it’s garish, psychedelic glittery pink wall hanging with decoupage butterflies. 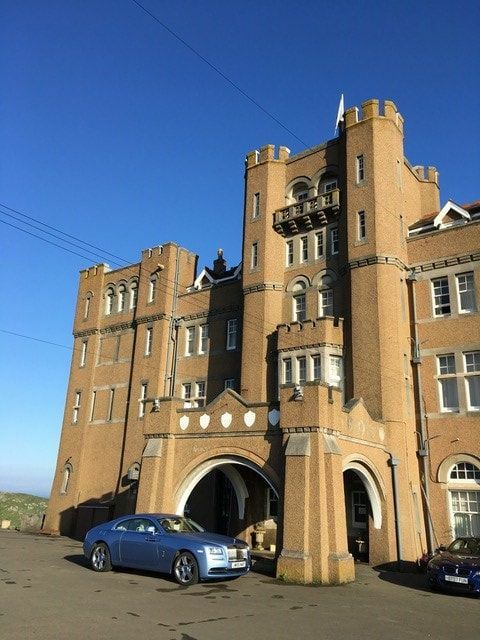 This castle hotel looked grand in it’s pictures and certainly has modest aspirations to be so, but with it’s pebble dash façade, garden gnomes in the lobby and pictures of the owner with various celebrity guests; it's quintessential English kitsch. Quite a delight, with gorgeous views from our room in which we drank smuggled prosecco and prepared ourselves for this epic road trip. There’s no smoke without fire, so let’s just agree Merlin was real! He was Welsh, of course, but we won’t get into the whole English v Welsh v Cornish v Celts debacle here. Tintagel Castle, or rather the sparse ruins thereof, where the legendary King Arthur hung out with his knights and old Merlin, is a pleasant walk from the village along a brook, past some exceptional dry stone walling and down towards the sea and Merlin's Cave. It is through this sea tunnel that the waves brought baby Arthur to the shore, from where Merlin carried him to safety. At least that's how it happened in Tennyson's Idylls of the King. We just admired it from above as the last section of steps down to the cove were closed due to storm damage. There aren’t many among our local friends who don’t have childhood memories of holidays in Cornwall. Mine are numerous, and all involved a frame tent, which took my parents hours to erect, and rain was a common feature. Rain or not, I adore Cornwall! Mostly, I am in love with the history of pirates and smugglers, and it's countless idyllic coves and beaches. But there is so much more: ancient villages, outstanding gardens (lost and found), tin mines and theatres, and pasties and cheese … and more cultural stuff that I can’t think of now because I’m too sleepy. But while we’d have loved to stay longer and do it all, we're on a pretty tight schedule, so what better place to start our trip than with the beginnings of English folklore and legend. Devon was the last county to stop executing witches – the last proclaimed witch bought it in 1685. Good to know. Also good to know … it’s Devon, not Devonshire. It used to be Devonshire, but its not now! Devon is rugged, brooding, raw and down to earth. Two beautiful coastlines, more roads than anywhere else in England and two expansive moors conjuring images of baying hounds … Devon is atmospheric and enchanting. A lot of world changing stuff began in Devon: Drake's first voyage, the launching of the Mayflower, Darwin's HMS Beagle set off for the Galapagos. Lots of ships set sail anyway. But more importantly, at least to us in that moment, Devon has cream tea. Clotted cream had been on my mind for some time and stopping for cream tea was the perfect end to the soul soothing walk we’d just had through Lydford Gorge to Devil’s Cauldron on the edge of Dartmoor. Arriving just before they opened meant we had the gorge, the trees, the stream and the birds to ourselves. 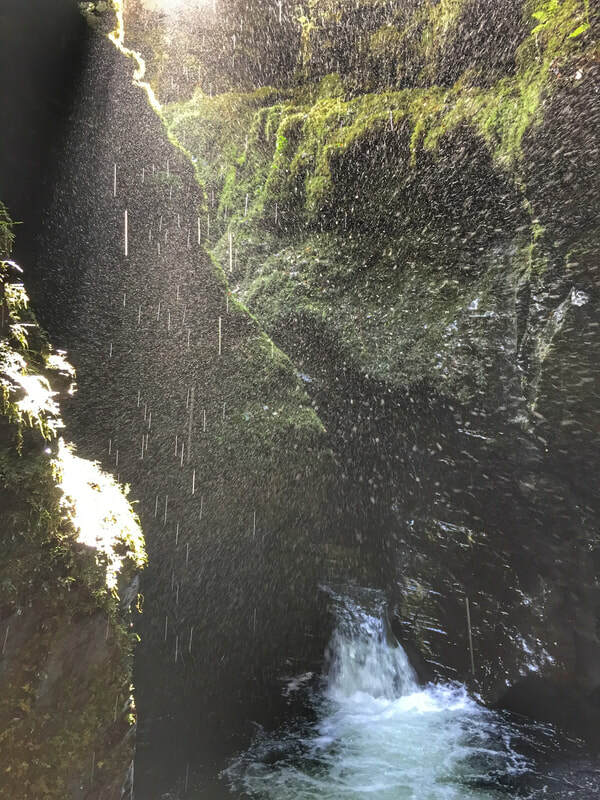 We took time to sit by the stream and watch the fish and listen to the birds, before approaching the few but steep and unguarded steps to the cauldron itself to stand under the mist. Home to a giant chalk willy (attached to the properly known as Cern Giant), Dumbledore (properly known as Durdledoor) and the Jurassic Coast; Dorset heaves with rolling hills, castles, cathedrals and stunning coastline rich in fossils should you want to go hunting. Lyme Regis is an old favourite of both of ours, so that’s where we chose. We both get pretty excited about dinosaury things, and Mary Anning was a Lyme native so in solidarity of the sisterhood we visited the museum to learn more about her work. She was (and still is) shockingly under-recognised for her discoveries in paleontology. 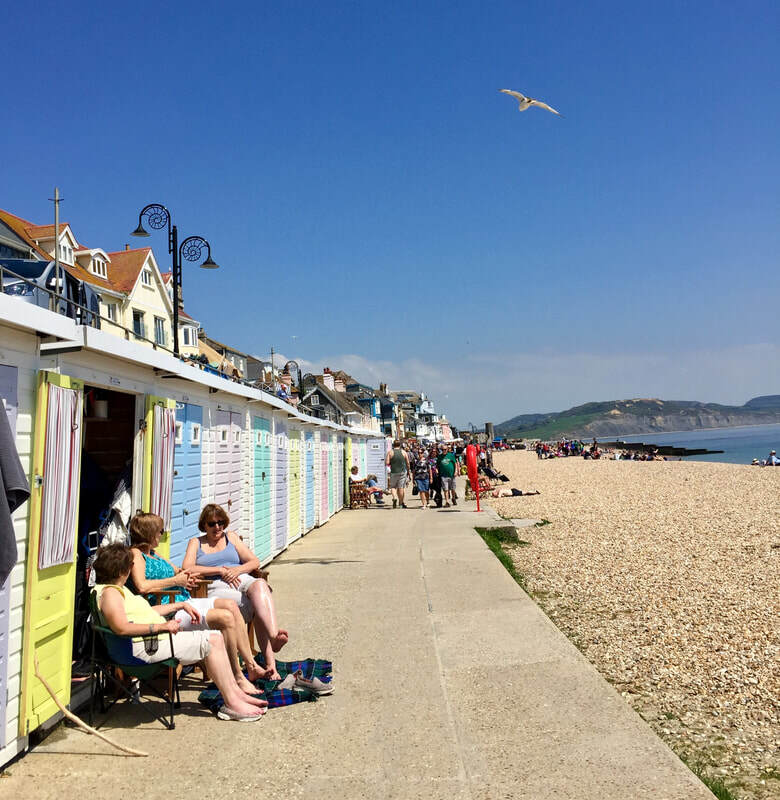 After dipping our feet in the English channel and dodging the (far too) many shirtless, sunburnt bank holiday weekend day trippers, we got a bit obsessed (OK, it was mostly me) about the need for a sandwich from the highly acclaimed Lyme Bay Sandwich Company. (Sandwiches were invented in Dorset by the Earl of Sandwich!) So in true English fashion we queued for about half an hour for what turned out to be a massive disappointment. But hey. We had this idea that we’d eat a regional food in each county. If Day 1 is anything to go by this is not a sustainable goal! We’ll explode. And that won’t be pretty. Lyme is quite hilly so the rather hurried stroll back up to the car – partly because we were behind schedule, partly because we had to get out of the throngs of people – was more exercise than we’d anticipated. Tiredness and an immense gormlessness hit during the 2 hour drive from Lyme to Portsmouth. Inevitably, we’ll be spending a fair amount of time in the car on this trip, but it’s about the journey as much as the destinations. Today we meandered through parts of England’s countryside that I have always loved: across Dartmoor, Blackdown Hills, Dorset Area of Outstanding Natural Beauty, New Forest National Park and, for a final leg to our overnight stop, South Downs National Park. Open expanses with views over rolling hills in all shades of green dotted with copses, sheep and cows. Rapeseed fields blazing yellow across the landscape, poppy fields in early stages of emerging casting hints of red, small winding roads snaking through dappled forest; this lush, wonderful countryside that is home has kept the happy sighs and exclamations of beauty coming frequently during those hours in the car ticking off the miles from county to county. 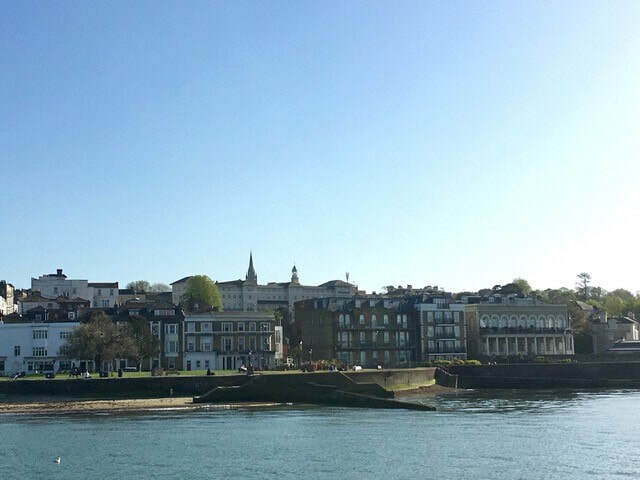 While playing with wild ponies in the new forest would have been amazing, the logistical need to get across to the Isle of Wight took us to Portsmouth, with its exceptional harbour … home, in 2012, to the sea based element of the Olympic Games. Had we more time, we would have visited the Mary Rose, that most spectacular Tudor war ship. Cam and I both remember watching the news when she was raised in 1982. The exhibit now is mind blowing. I could stand and look at that ghost ship for hours. 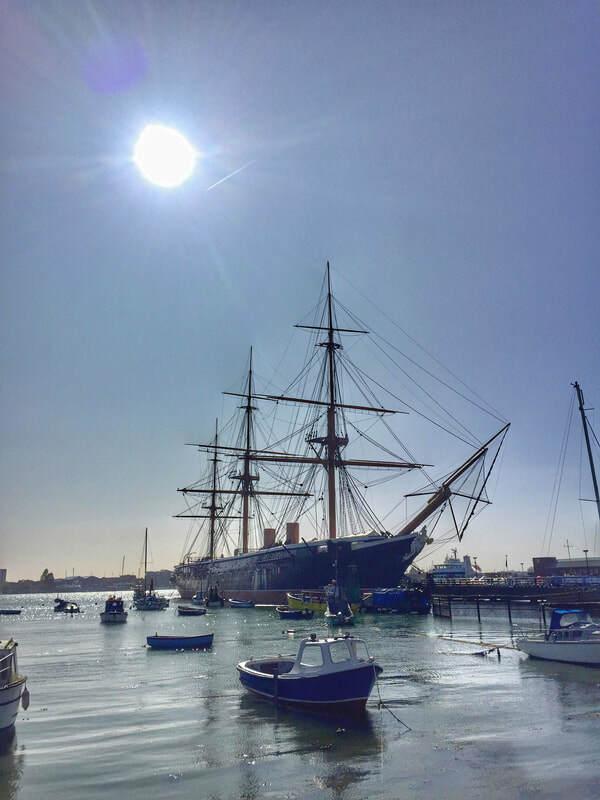 Instead, we enjoyed a gawp at HMS Warrior, and a pint of Old Thumper in The Ship Ansen, before heading for the harbour pier. All around a careless-ordered garden. Measuring just 23 miles by 13 miles, Isle of Wight is the second smallest county in the country (Rutland being the smallest). It has a charming old English seaside feel to it, with a stuck in the 80s vibe. I’d say we covered a fair percentage of that total mileage, having walked about a mile each way from the ferry terminal to the sea front of Ryde. That's 15% of the width of the county covered already. It was such a beautiful evening, we could have just kept going around the coast path, past the yachts at Cowes and on towards the needles. Another time! From this trip we'll gather places we'd like to revisit and spend more time in, but for now, following a fun fast cat crossing that blew the cobwebs away (last time Cam crossed the Solent, she swam it! ), we enjoyed a perfect fish and chip supper on the sea wall, before hopping on the last fast cat back to Portsmouth. And not one single seagull tried to steal a chip! 5 counties down, 43 more to go!